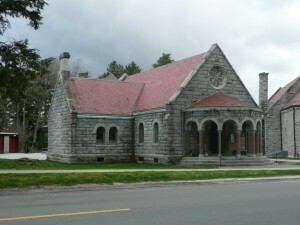 This Romanesque style building has one story, with a red slate roof, and is intact. It has a cruciform plan styled after a Norman church. 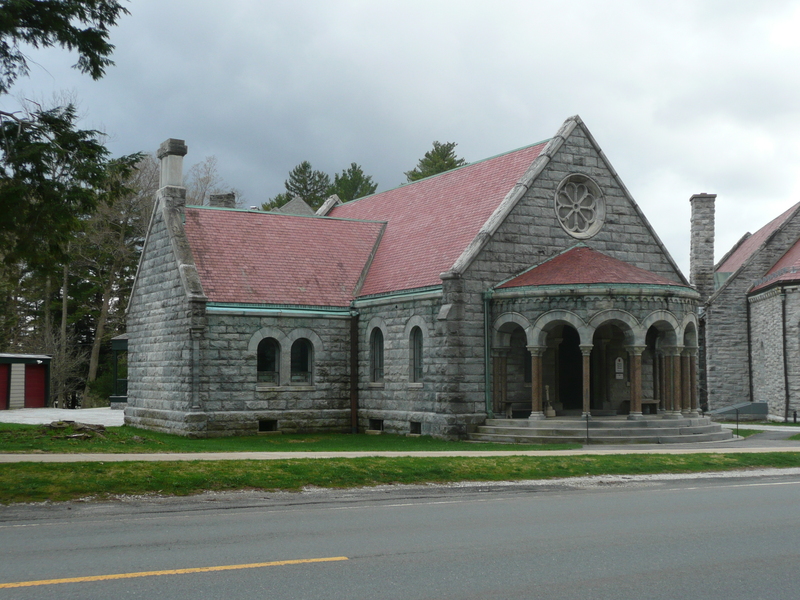 The masonry construction is of rock-faced granite with a dressed granite trim. It has a front gable roof with parapet walls, and wings with cross gables, also having parapet walls. There is a tall stone side wall chimney behind the Right side wing and the front entry porch on the East side is in the form of a semi-circle with Roman-arched openings, 7 sets of columns & 2 sets of pilasters, each with a different capital cornice with reverse crenellated molding. Semi-circular steps and stoop lead up to the porch. There is an arched door surround with 2 granite columns and a curvilinear carving on the stone header & plain stones on outer band. There are Roman-arched double entry doors with elaborate metal strap hinges. A small rose window is in the gable peak above the porch and small rectangular attic windows in the cross wings. Projecting from the Southwest gable end is a shallow chancel with a slightly lower gable roof. Windows in pairs & sets of 3 are Roman-arched and 2 flank the Northwest side entry. The foundation is of stone. Trinity Church was listed on the National Register of Historic Places on February 26, 1996. In 1896, John E. Parsons, a wealthy New York attorney. gave Trinity church this handsome Parish House in memory of his late wife, Mrs. Mary Dumesnil Parsons, who had died the same year (1896). The Parsons, who also lived in New York City and Rye, N.Y., had been summering in Lenox since 1871. The Parish House was built to resemble a small Norman church and to be consistent with Trinity Church. Maxfield Parrish (1870-1966) was selected to paint the over-mantel for the parlor, which consisted of two panel oil paintings on wood. Parsons also donated handsome directional markers to the Town of Lenox. One is on the corner of the property in the form of an obelisk stone marker. They were erected in Lenox in 1892, but the marker which is now on the Trinity Parish property was not moved there until 1927. The Parish House has seen use as a church school, for youth group meetings, AA, and recreational and social activities. Trinity Church, Lenox. John Allen Gable,1966. Interviews with Mrs. Robert Whitman, wife of the pastor of the church. Gable, John Allen. The Goodness that Doth Crown Our Days, A History of Trinity Parish, 1993. Palmer, C.J. History of Trinity Church, 1763-1895 , Cambridge,1895. Tucker, G.H. History of Lenox, 1936, Republished by Lenox Library, 1992.